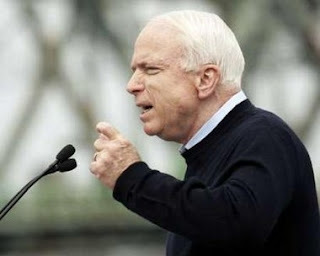 The Natural Truth: "Juan" McCain Rides Again! Coming as a surprise to absolutely nobody, Sen. McCain is already back in the "Banana Hammock" on the issue of border security. With McCain, it's always "Amnesty or Bust!" His pro-amnesty allies believe legalizing crimmigrants will be on one President McCain's highest, and most immediate, priorities. They probably believe this because he keeps saying it, over and over again. And now he's agreed to speak to the National Council of The Race (La Raza), an openly-racist advocacy group supporting illegal immigration into the US. Everything you need to know about the National Council of The Race is covered by Michelle Malkin. Read it, and then weep for the future of the Republic. After all, McCain is currently the TOUGHEST candidate for president on the issue of crimmigration. Where Have All The Illegals Gone?